Executive Assistant General Motors of Canada Ltd. Worked for General Motors of Canada for 28 years and unfortunately a casuality of the June 1st bankruptsy....Married Ward Dovey (Cathy’s brother) and very proud of my two children Tim, 17 and Julia, 15. 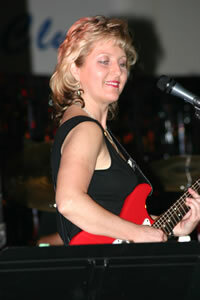 LOVE playing guitar and I’ve been performing with a working cover band for the past 8 years. Having so much fun playing gigs about once a month, and I jam every Friday night with my bandmates. My son Tim is a WICKED guitar player which makes me so proud and Julia, well, as a consistent A honours student, she can be anything she wants to be and is a great guitarist in her own right. Can’t wait to see everyone at the reunion! Was a bit of a hippy and probably didn't do as well scholastically as I should have! My favorite time was playing 12 String guitar with the band in our school musical "Fiddler on the Roof" Loved Musicianship 12....just played guitar !!! THERESA SUPEENE DOVEY has a birthday today.